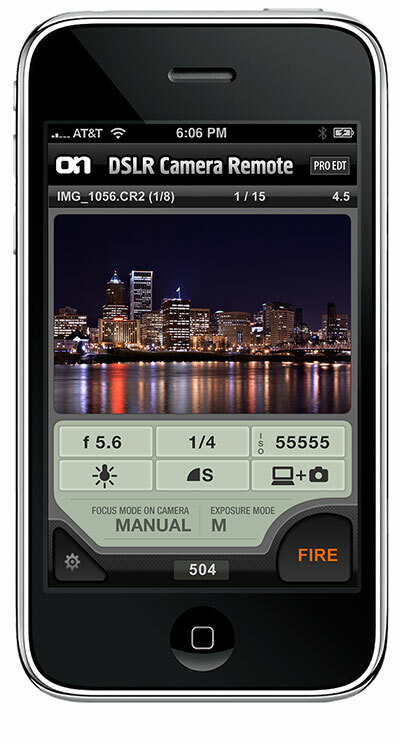 My pal Craig sent me a notice that there is soon to be a new iPhone App from onOne called the “DSLR Remote” and is a wireless cable release for your Canon camera. Here’s hoping it works with all functions and is portable from camera to camera without difficulty (since as a digitech I’m working with different gear on a regular basis). UPDATE: I shot in the studio yesterday with the Canon 5d Mark II tethered to a Mac and used the DSLR Remote iPhone app to shoot — it worked great! The controls are simply and logical and changes are near instantaneous and the previews show up on the iPhone quite quickly. You can even zoom in by double-clicking on the area you wish to examine. You can imagine the dropped jaws when the other photographers saw it in action! I’ll be keeping this app installed and ready to use.